Reaching 80 is a momentous occasion, so it deserves to be celebrated. But it's important that an 80th birthday party is handled sensitively and diplomatically. So consult the birthday honoree before making any plans—especially when it comes to things like the guest list. I would suggest making the effort to invite any estranged family members or close friends that they may have drifted apart from or fallen out with. An 80th birthday party might provide a good opportunity for people to put any differences behind them and come together. But always check this with the guest of honour first. Elderly people can be very set in their ways and you don't want to upset them by inviting someone if it's going to be awkward or create tension—no matter how good the intention may be. 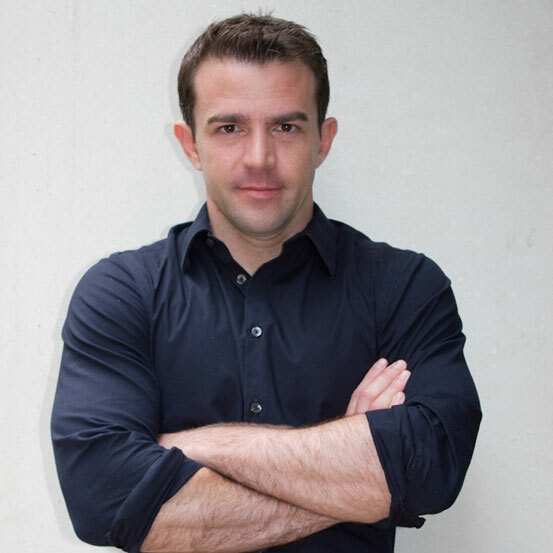 Also, make sure you consider energy levels and how active the person is before deciding on the format of your party. Sometimes a lunch or afternoon tea party suits 80th birthdays better than an evening party, as the guest of honour may get easily tired. Either way, remember to tailor it to their personality as much as possible by including references to their favourite things. There's nothing worse than a generic birthday party that just focuses on the fact that they're 80. Think about whether the honoree might prefer to get friends & family together for a group activity, rather than a conventional 80th birthday party. what about a theme party? The reason you should avoid adding a theme to these 80th birthday party ideas. Read these touching 80th birthday party ideas that start the celebrations early. Where to find the most tastful personalized 80th birthday party invitations. Thoughtful ideas for making the birthday honoree feel special on the day. 80th birthday party decorations that aren't cheap and tacky. A few simple tricks to make your food & drink look like it's been styled by a pro. Ideas for 80th birthday party games, activities, and other fun stuff. Thoughtful and personalized gifts, card, and wrapping to go with these 80th birthday party ideas. Not everybody turning 80 is going to want to celebrate with a traditional party. Consider whether the birthday honoree might prefer to get friends and family together to share in a group activity or experience. Instead of just going out for dinner or lunch, celebrate by doing something a little more special. When I think about buying a birthday gift for friends / family, I always try to choose something that they wouldn't ordinarily buy for themselves—so that it feels more like a treat or indulgence. I recommend taking the same approach when choosing a group activity to celebrate their birthday. Organize something you think they'll enjoy, but is not something they do often (or have ever done before!). This will create unique memories associated with their milestone birthday. For more 80th birthday party ideas and group activities like these, check out the link below. Unfortunately, not all activities are available in every city, but to check availability in your area and to book places, click on the link below. These are just a small selection so if you can't find a particular activity in your area, you might discover some new ones. Put the birthday boy / girl at the heart of the celebrations and make everything as personal as possibe by including memories, nostalgic elements, and a few sentimental tributes. There's nothing worse than a generic birthday party that just focuses on the fact that they're 80. The birthday honoree will have a lifetime of memories to look back on, so it's always a good idea to celebrate their accomplishments and share happy memories. Let them reminisce and re-live fond memories but remember to keep it upbeat and happy. Don't only focus on the past, you want them to feel good about the fact that they have reached 80 and that there is still plenty to look forward too. Older people can easily get emotional so you have to make sure the tone of the party is positive—you don't want them to feel like it's a send-off! So concentrate on celebrating the person, not just their age. As you'll see below, there are still lots of ways to include the big 80 into the party theming and decorations without it dominating. But instead of making the number the focus, relate everything back to the person so that it becomes a celebration of their life, shared with friends and family. If you want to add a theme to your party, check out some of my other theme party pages by clicking on any of the icons below. These are fully designed parties with ideas for invitations, party food & drink, and decorations. They're designed with both kid's and adult parties in mind, so not all of the ideas will be relevant, but you might come accross some additional ideas to go with the specific 80th birthday party ideas below. This is a really thoughtful idea and I love it because it fits prefectly with the idea of celebrating the person and making their 80th birthday really personal. It takes a bit of planning, but it's worth it. Make a list of 80 of the birthday boy or girl's friends, family, and co-workers and mail them any one of these blank, pre-addressed, postcards (which can be personalized for any age / milestone birthday). The postcards come with a 'directions card' that asks them to write a favorite memory, kind note, or birthday wish for the birthday boy / girl and mail them back in the week leading up to their 80th birthday party. This idea is particularly useful for including friends and family far away, who might not be able to attend the party, or for those that they're only in occasional contact with, such as old school friends. Don't worry if you can manage to get 80 people to send in messages, any number will do. The birthday boy or girl will be really touched to hear from so many people in such as personal way. Be sure to ask people to make the message as personal as possible, whether lighthearted or heartfelt. To make it as easy as possible for people to the return the "80 Messages from 80 Friends" postcards above, be sure to attach a postage stamp to them before you mail them out. As the birthday boy or girl is likely to keep the returned postcards for years to come, a really nice way to enhance them is to use these personalized photo stamps (below left). I'd suggest uploading 3 photos of the birthday boy or girl from different stages of their life, e.g as a baby, at college, and present day, which will bring a smile to the faces of both the recipient and the birthday honoree when mailed back. Note: these are available for USA postage only. Check them out here. Another great way to enhance the "80 Messages from 80 Friends" postcards is with these scannable stickers that allow you to add a personalized voice or video message. Friends and family just record a video or voice message on their phone, link it to one of the QR code stickers, attach it to their postcard, then when the birthday boy or girl receives it they scan the sticker with their phone to play back the personalized message. What an amazing way to bring these birthday greetings and memories to life! The stickers come in packs of 100 so you can use them in many other ways unrelated to the 80th birthday, for example adding grandpa's voice to a kid's storybook or leaving instructions around the house for guests—such as how to use the TV remote. Check them out here. Spread the love over the entire day! Rather than buy one big gift, choose 12-18 smaller presents so that they can open one every hour—at 80 minutes past the hour! How cute would it be to pack the birthday boy or girl off to work with a bag full of small gifts to open throughout the day? You could even drop them a message every hour to prompt them or even call to share their response to each gift. Also, check out this supplier for tasteful gift tags, such as the chalkboard-style ones below (lots more designs available). Attach one to each gift and write on the time they should open each one, i.e 10.80, 11.80, 12.80 etc. I came across these photos below and thought this idea would make a great 80th birthday card or gift. Have friends and family spell out a birthday message by having each person hold up a sign with one letter or word on it. It could be "We love you Mum" or a simple "Happy 80th Birthday". Just Google 'printable letters' to find some free templates that you can email to friends and family. Ask them to color their letter in (you might want to tell everyone which color to choose), take a photo against a light colored wall, and then email it back to you to arrange into one image. If you need any help to combine all the photos together in one final image, you can email it to one of these guys to do it for you for around $5. Check out my seperate page of 80th Birthday Party Invitations for creative and unusual invitation ideas. Similar to the '80 Messages from 80 Friends' idea above, this version by Holly at Nothing But Bonfires, focuses more on memories and friendships, rather than just birthday greetings, to celebrate '80 Years of Memories'. Have friends write a one page letter to the birthday boy or girl that recalls a memory they share—perhaps something funny about how they first met or something that really cemeted their friendship—the more nostalgic the better. Unlike the postcards, I would gather all the letters up and present them to the birthday boy or girl as a gift at their 80th birthday party. I like the way they've been presented in the pictures below, you can pick up different styles of vintage airmail envelopes here to create something similar. These letters are likely to be kept and treasured for years and so would make a wonderfully thoughtful and sentimental 80th birthday gift. One way to turn these into a more substantial gift would be to present them in one of these personalized keepsake boxes featuring photos of the birthday boy or girl at various stages of their life. Check them out here. These personalized photo books are another great way to celebrate a 80 years in pictures. Rather than just creating one using your own photos, contact friends and family and ask everyone to send you a photo of the birthday boy or girl from their own photo collection—along with a short memory about the photo summed up in a few sentences. This way you'll get to include lots of photos that the birthday boy / girl might not remember (or have even seen before!). You could even contact people at the same time as asking them to write a letter for the '80 Years of Memories' above, so that you get memories as both words and photographs. Another way to celebrate the person on their 80th birthday is to have everyone contribute a few words to this list of '80 Reasons Why We Love You'. You can buy a printable of the template here, which you can then scale to any size. You could set this up as a guestbook as people arrive at the party and have them handwrite their reasons. Alternatively, it looks just as good when the messages are typed, so you could have it prepared in advance and then present the birthday boy / girl with a framed copy as a birthday gift. You could also display it somewhere prominent at the party so that people can read what others have written, or read some of them out if you're planning to make a few speeches. I've also seen this idea presented in different ways, such as labels on beer bottles served at the party (below left), displayed on pegs as 80th birthday party decorations (below center), or even in a jar presented to the birthday boy / girl (below right). These ideas for creative guest books are actually from weddings, but I think they're just as appropriate for making these 80th birthday party ideas personal and filled with great memories. One final option along the same lines are these prints that spell out a name embedded with your photo, like the example below left available here, or spelling out the occasion e.g 80th Birthday, like the example below right available here. Another way to create great memories of their 80th birthday party is to set up a polaroid photobooth. You can pick up the new modern Polaroid cameras quite cheaply here. Set up a chalk board with instructions for guests and ask everyone to stick their photo into a guest book and leave a message for the birthday boy / girl. Or you can get printable signs here, such as the one below center right (other designs available). These fan faces are a fun way to greet the birthday boy / girl when they arrive at the party—especially if it's a surprise 80th birthday party. I would suggest you get them made using a few different photos of the person, from different stages of their life, to make it more fun. Check them out here. These photo yard signs would make a great entrance to a 80th birthday. Although the example photos below were for a graduation party, you could easily use these to celebrate the birthday boy or girl 'through the years'. It's always fun to see old photos of loved ones when they were younger—that perhaps many of their friends have never seen before. Just use the 'customize it' tool to change the text and colors to whatever you want, as I have with the mock up below showing the different stages of someone's life. They come as either a set of 6 or 15, with the set of 6 only $30 so it's a pretty inexpensive way to create a big first impression as guests arrive. Check them out here. The reason I love the banners above is that you can add multiple photos from different stages of the persons life to each banner. However, another way you can go about it is to customize these milestone birthday banners one at a time with a different photo of the birthday boy or girl. Note: You can also change the spearmint green background color shown in the examples below during the customization process by selecting "customize it", then "images & background", then "edit your background", and chosing a color from the swatches shown. These banners are a little more straightforward to customize and are part of a collection of matching 80th birthday party decorations and tableware, in case you want everything to look the same. Check them out here. This photo collage idea, below left by Kami at No Biggie, was actually to celebrate her parents 80th wedding anniversary, but I think it would work well as a wall display or dessert table backdrop for a 80th birthday party too. Just arrange photos of the birthday boy / girl from different stages of their life into a 80 shape—it's a great alternative to all those store-bought party decorations with 80 emblazoned on them which just look a bit cheap and tacky. This approach is much more personal and fits in nicely with the idea of celebrating the person, rather than just their age. I particularly like the way the photos are mounted onto a chalkboard, which allows you to add more personalized scribbles surrounding the photos. You can achieve this look by using chalkboard contact paper available here, or even chalkboard paint. Note: be sure to practice marking out the shape of the numbers first to ensure the widths are all in proportion—there are lots of examples of "Pinterest Fails" all over the web where people have tried to arrange the photos themselves and they come out too thin and tall, or don't match each other, and the display just ends up looking messy and amatuerish. For something a little more permanent, check out various option here for having the 80th birthday collage made into a print or canvas, like the examples below, so that it doubles as a birthday gift. I came accross this tutorial for how to make a balloon chandelier for a bridal shower on Wedding Chicks and it gave me an idea for a fun way to customize this for a 80th birthday party. As well as attaching different photos of the birthday boy or girl from different stages of their life, on the back of each image you could include a 'Fun Fact You May Not Know About [insert name].' The fun facts could be obscure, trivial, or random things about the birthday boy / girl—embarassing gaffs, amusing anecdotes, favorite things, dislikes etc—anything that gives an insight into their character, as oppose to dry facts that people are likely to already know. This a great way to add a personal touch to the party decorations. These photos of number-related facts about a couple on their 50th Wedding Anniversary, from Marta Writes, is another cute idea that can be repurposed for a 80th birthday party. I like the way they used them as decorations and it gives party guests something to do early on while waiting for everyone else to arrive. You could display facts about the birthday boy / girl, relating each one to a number from 1 - 80, or you could display facts about the year they were born that relate to each number. Another easy way to decorate for a 80th birthday party is simply to peg photos of the birthday boy / girl—arranged chronologically through the years—onto string or ribbon and use these as garland banners. Lots of people do this for kid's birthday parties, but it can be quite fun to do for a 80th birthday party because guests often won't have seen pictures of them as a baby, toddler, child, teenager, student, etc. You're probably better off scanning any original photos and printing copies off onto cardstock using your home printer so as not to risk them getting damaded. Alternatively there's a wide range of 80th birthday banners, such as theo nes below, available here. If you don't want the hassle of collecting up old photos in order to create the custom 'Through the Years' banners above, there are a few general banners, such as the ones beow, available here. The advantage of these banners is that they are part of a collection of matching 80th birthday party decorations and tableware so you can co-ordinate then with other party supplies. These letter and number balloons are a great way to decorate the entrance to the party, or to use as a backdrop to bars and food tables. Use them to spell out things like 'welcome', the birthday boy / girl's name, the year of their birth, their age; 80 or forty, phrases such as 'forty & fabulous', 'cheers', or just 'happy birthday'. Warning: I would suggest you don't buy these from sellers on Amazon. There have been so many reviews of poor quality balloons that have holes in, tear easily, arrive in the wrong color, or the seams splits when inflated. Instead, I would suggest you get them here—the suppliers are far more reliable. Check out this tutorial from Our Best Bites for a similar idea for photo luminaries which you could also use as 80th birthday party decorations. You just print photos of the birthday boy / girl onto sheets of velum using your home printer and then apply to glass jars with double sided tape. There's a great example, below right, from Perfect Party Orlando who used these to create table decorations for a 50th birthday party. These 'Biggest Fan' big head cut outs are typically used for sporting and homecoming events, but I think they could be used as decorations for a 80th birthday party. They're 36" high and if you order 2 or more they're only $18. Print several using photos of the birthday boy / girl at different stages of their life then hang on walls, on string from the ceiling, or lining the drive/walkway up to the entrance. You can also use them again for photo ops later on in the party. Full body life size cut outs are also available. Check them out here. These cool balloons, printed with funny or adult slogans, are a great way to make traditional party decorations a bit grown up. There are a number of age-related slogans too, so they're perfect for a 80th birthday party. Check them out here. Check out my Pinterest boards for 80th birthday party food ideas, including sweet and savory ideas both hot and cold. For a 80th birthday party, a fun addition to the dessert / buffet table would be retro candy from the birthday boy or girl's childhood. You can buy either a selection box for a particular decade or individual candies. If you're choosing a decades pack, remember to think about what year they would have been around 8-10 years old. For example, if they were born in 1978, you're probably better off getting a 1980's selection box as they'll have more memories of those candies than of ones where they were only 2 years old. Check out the full range here. Update: Some alternative options now available here too. These silhouette style cake toppers are a great way to personalize a 80th birthday cake. There are lots of different styles and designs available, including ones that incorporate the birthday boy / girls's name with their favorite sports or hobbies, or you can go for a more funny photo-based topper. See the full range here. Alternatively, I love these hand-sculpted cartoon figure style toppers (below far right), that are made from a photo of the birthday boy / girl, surrounded by things that represent their lives. Check out other examples here. These custom photo collage paper plates are a great way to create really personal 'Through the Years' style party supplies by uploading photos of the birthday boy or girl at different stages of their life. They're also far more special than the regular store-bought 80th birthday party supplies emblazoned with 8-0. There are a number of different designs available, depending on how many photos you want to include, and you can just use the 'Personalize' to change colors, fonts, and text. Check out all the options here. If you don't want to create custom photo plates, there's also a range of tasteful 80th birthday party supplies available here that includes matching plates, cups, cutlery, and other decorations, such as banners. An easy way to style the dinner or buffet table for a 80th birthday celebration is to use these personalized napkin wraps, below left available here, or these glittery 80 napkin holders that come in a range of different colors, available here. Alternatively, you could continue the 'Through the Years' theme by wrapping cutlery in napkins and fixing them in place with these stickers printed using old photos of the birthday boy or girl as a kid—they're only 5¢ each—available here. A really easy way to theme party drinks for a 80th birthday party is to have personalized beer, wine, or spirits labels made. There are lots of different designs available, many which allow you to upload a photo, and some are available as printable files so you can run off as many as you like at home. Identical bottles will look great lined up on a bar or drinks table and it's a really simple touch you can add to make everything feel a little more special. Check out this site for the full range. Another easy way to theme a 80th birthday party is with these personalized plastic party cups. They're available in a range of different designs for any age. Check them out here. There are also lots of other ready-made 80th birthday themed napkins that you can buy 'off the shelf' which work out cheaper than the personalized ones. Check out all the options here, or for the 'Making America Great Again' design pictured below see here. These customized versions of the classic game Guess Who would make a really fun personalized gift for a 80th birthday. The game's usual faces are replaced with photos of friends and family so you can guess their identity with fun questions such as 'Was your person a bed-wetter? ', or 'Has your person ever been arrested?'. There are a few differently-priced options available depending on the finish; option 1 here, or option 2 here, or option 3 here. There are lots of 80th birthday games and trivia, available here, as well as almanacs and funny books (such as 'You Know You're 80 When...'), available here, that are cheap and easy ways to add some entertainment to your party. Check out my other page of 80th birthday gifts for thoughtful, sentimental, and meaningful gift ideas such as the ones below. Check out my other page of 80th birthday gifts for ideas for lovers of literature, such as the ones below. Check out my other page of 80th birthday gifts for a selection of lighthearted, humerous, and fun gift ideas, such as the ones below. Check out my other page of 80th birthday gifts for lovers of technology and gadgets, such as the ones below. Check out my other page of 80th birthday gifts for ideas for food & drink connoisseurs, such as the ones below. If you've enjoyed these 80th birthday party ideas, please help me to promote my website by sharing this page. Just click on the Facebook or Twitter buttons below to post a link back to this page, or share this collage image. Alternatively follow the "Enjoy this page?" 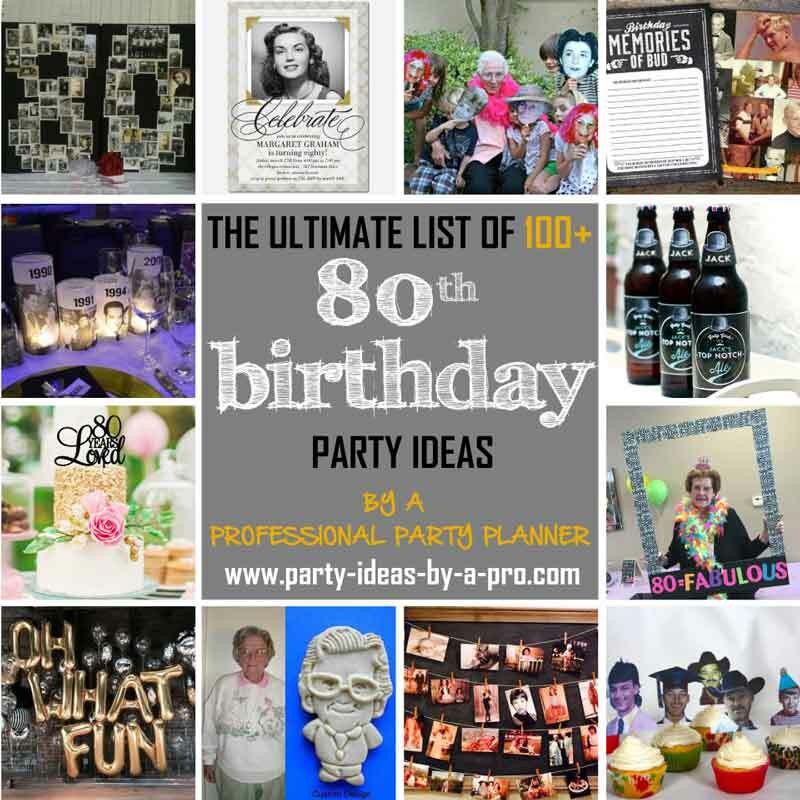 link under the logos below to get the address for this page of 80th birthday party ideas so you can paste directly into your own blog, website, or any forum that you contribute to.